MAPK9/JNK2 antibody recognizes mitogen-activated protein kinase 9, also known as Jun kinase, MAP kinase 9, MAPK 9, c-Jun N-terminal kinase 2, c-Jun kinase 2, stress-activated protein kinase 1a or stress-activated protein kinase JNK2. Mouse anti Human MAPK9 / JNK2 antibody recognizes the mitogen-activated protein kinase 9, also known as Jun kinase, MAP kinase 9, c-Jun N-terminal kinase 2, c-Jun kinase 2, stress-activated protein kinase 1a and stress-activated protein kinase JNK2. Encoded by the MAPK9 (JNK2) gene, mitogen-activated protein kinase 9 is a member of the MAP kinase family. MAP kinases act as an integration point for multiple biochemical signals, and are involved in a wide variety of cellular processes such as proliferation, differentiation, transcription regulation and development. This kinase targets specific transcription factors, and thus mediates immediate-early gene expression in response to various cell stimuli. It is most closely related to MAPK8, both of which are involved in UV radiation induced apoptosis, thought to be related to the cytochrome c-mediated cell death pathway. MAPK9 and MAPK8 are also known as c-Jun N-terminal kinases. This kinase blocks the ubiquitination of tumor suppressor p53, and thus it increases the stability of p53 in nonstressed cells. Studies of MAPK9's mouse counterpart suggest a key role in T-cell differentiation. Several alternatively spliced transcript variants encoding distinct isoforms have been reported (provided by RefSeq, Sep 2008). 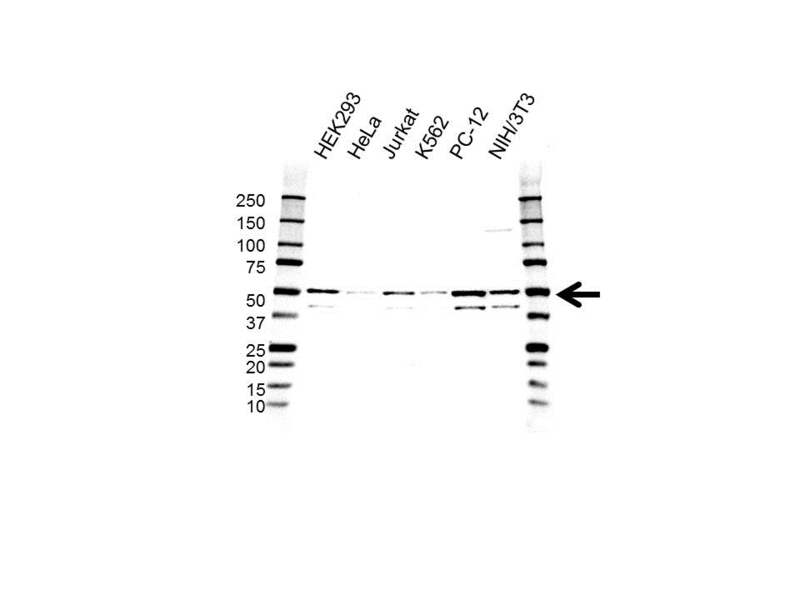 Mouse anti Human MAPK9 antibody detects a band of 54 kDa. The antibody has been extensively validated for western blotting using whole cell lysates.